At the Top of Squirrel Spur: Spinning With Friends! Beautiful Joan and lovely Tammy spinning! We had a fabulous day for World Wide Spinning in Public Day here in Meadows of Dan. Thanks to our local media, who were gracious enough to print and broadcast a press release I sent out, we had a nice turnout of spectators to see us demonstrate our spinning skills. It was sunny and a bit too breezy at first but things finally settled down. 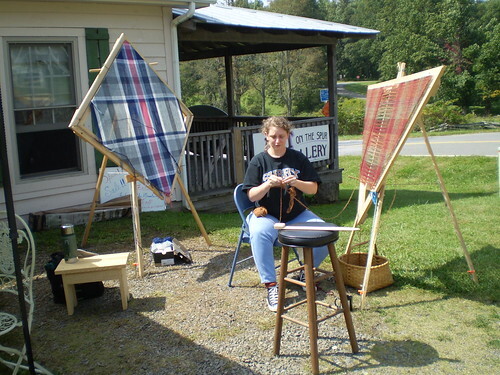 Kathleen got a lot of attention, too, with her lovely weaving projects on her frame looms. She's a teacher and her explanations of her art were really interesting. We had some visitors from England yesterday and I think we made a good impression! 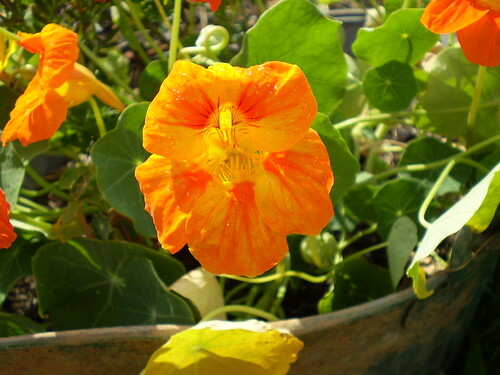 Tammy got some really great pictures that she posted on her blog. I should have taken a lot more but I kept getting distracted by the great conversations we were having. 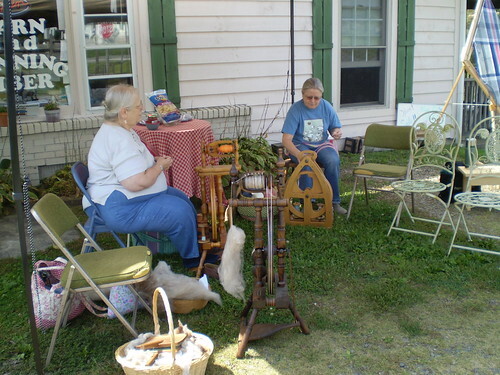 Kathleen is well-traveled and very interesting, while her mother, June, is knowledgeable about so many different aspects of spinning and other crafts that it was great to compare notes. 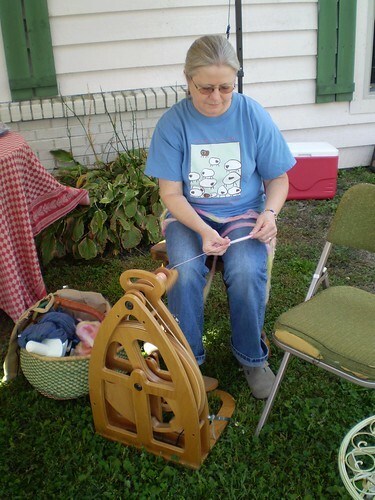 Tammy is a gifted knitter and spinner, and there's always something to learn from her as well. Next year I'm going to plan a little better and not have WWSIP Day on such short notice. Still, I'd call this one a success and I really enjoyed my time with these talented ladies! 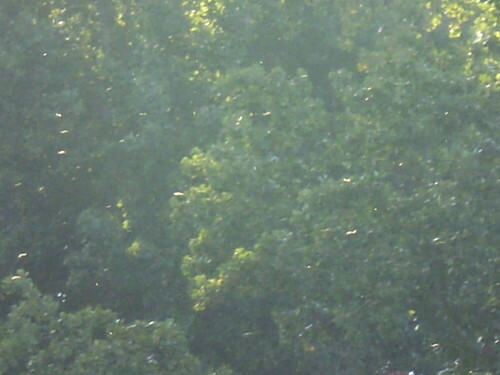 Did the Fairies visit Meadows of Dan? I had all these plans for working outside Wednesday, and of course it was raining when I got up. 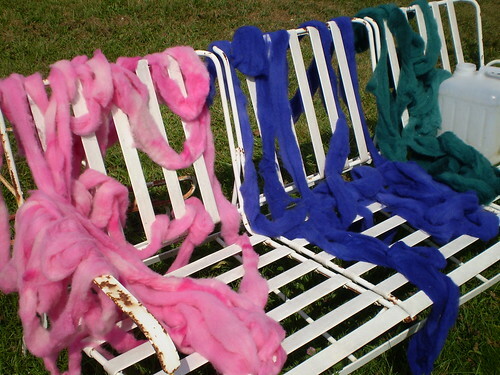 So I hauled out the dye pots and poked some Texel roving in while I snapped half-runner beans. I'm thinking of crocheting some cushions for this lawn swing...think it needs them? The sun came out later in the day but by then I was on the road for a quick up the road and right back down again trip to Northern Virginia. I hear I'm going to have to do it again this week...wonder when I'm supposed to get the yard, garden, bunny house and housework done?